Non-league Exeter produced a magnificent rearguard action to earn a deserved FA Cup third round draw at Premiership giants Manchester United. United fielded a weakened side, but Conference Exeter matched the FA Cup holders to set up a lucrative replay. Exeter's former United apprentice Andy Taylor tested goalkeeper Tim Howard and fired a free-kick narrowly off target. 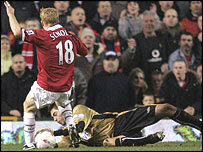 United threatened after the break, with substitute Paul Scholes firing only inches wide deep into injury time. United, predictably, left out most of their big names, but recalled goalkeeper Tim Howard in place of Roy Carroll after his performance against Spurs on Tuesday. And even though United were weakened, Exeter still delivered an outstanding display to keep them comfortably at bay in the first 45 minutes. Taylor was the main threat, with a shot that Howard did well to block, and a free-kick that curled inches wide into the side-netting. United's only serious response was a free-kick from David Bellion which was well saved by Exeter goalkeeper Paul Jones. Lifelong Manchester United fan Dean Moxey almost stunned his boyhood heroes three minutes before half-time, but shot narrowly wide after a scramble in the penalty area. United stepped up the pace after the interval and Scott Hiley needed to clear a shot from David Jones off the line after 48 minutes. But Exeter could still see the dream, and Moxey gave United another scare with a long-range effort that flew just wide. Goalkeeper Jones came to Exeter's rescue as United finally threatened, back-pedalling to turn over Wes Brown's header. Sir Alex Ferguson had seen enough and threw on the big guns after 63 minutes, with Paul Scholes and Cristiano Ronaldo replacing the disappointing Liam Miller and Chris Eagles. The extent of United's struggle to break down Exeter's magnificent resistance was illustrated when Ferguson sent on Alan Smith to replace Bellion with 14 minutes left. And he almost had an instant impact, setting up Ronaldo for a powerful drive that was brilliantly saved by Jones. Man Utd: Howard, Phil Neville, Brown, Pique, Spector,Eagles (Ronaldo 63), Djemba-Djemba, Jones, Miller (Scholes 63),Bellion (Smith 76), Richardson. Subs Not Used: Heinze, Ricardo. Exeter: Jones, Hiley, Sawyer, Gaia, Jeannin, Martin,Clay (Ampadu 66), Taylor (Edwards 89), Moxey, Devine,Flack (Afful 74). Subs Not Used: Rice, Sheldon.